Republicans are rushing to make it harder to vote in states like Michigan, New Hampshire, North Carolina, Texas, and Wisconsin. Less than a month after Donald Trump unexpectedly carried Michigan by 10,000 votes, Republicans in the state legislature are already pushing to make it harder to vote. The presidential recount hasn’t even finished yet and Michigan Republicans are trying to pass a strict voter-ID law through the lame-duck legislative session before the end of this year. Under current Michigan law, a voter who does not present photo ID at the polls can sign an affidavit confirming their identify, under penalty of perjury, and cast a regular ballot. Under the new bill, which passed the House Elections Commission on a 5-3 party-line vote on December 1, voters without strict ID would have to cast a provisional ballot and then return to their local clerk’s office within 10 days of the election with photo ID to have their votes counted. This change to Michigan’s election laws could make a big difference in future elections: 18,339 people without strict photo ID used the affidavit option to vote in 2016—8,000 votes greater than Trump’s margin of victory. One-third of the affidavits came from Detroit, where Hillary Clinton won 67 percent of the vote in Wayne County. Like Trump, Lyons presented no evidence of voter impersonation or other types of fraud to justify her bill. She passed the bill in her committee after just two days of testimony last week, when the rest of the state was preoccupied with the recount. The bill included $10 million to pay for the voter-ID law, which sounds like a good thing, but makes it impossible for voters to overturn the law via referendum. Despite their stated concern for voter fraud, Michigan Republicans on Friday sued to block a recount of the state’s presidential votes, which would’ve ensured the accuracy of the final count. The brief by Michigan Attorney General Bill Schuette criticized Jill Stein because “she cited no evidence of fraud or mistake in the canvass of votes,” even though a similar paucity of fraud hasn’t stopped Republicans from pushing for voter ID. In New Hampshire, newly elected GOP Governor Chris Sununu has called for eliminating same-day registration, and Republicans in the legislature want to tighten residency requirements to vote. In North Carolina, GOP Governor Pat McCrory spread bogus claims of voter fraud before finally conceding to Democrat Roy Cooper, while conservative groups are challenging same-day registration and the GOP legislature is considering packing the state Supreme Court in a special legislative session beginning December 13 to reassert Republican control after Democrats won a 4-3 majority on election night. In Wisconsin, Republican leaders called for cutting early voting, again, after high early-voting turnout in Democratic cities like Madison and Milwaukee. “We’re probably going to have to look at it again to make sure that everybody in the state has the same chance to vote,” said House Speaker Robin Vos. In Texas, Lt. Gov. Dan Patrick has called for reviving the state’s strict voter-ID law, which has repeatedly been struck down as discriminatory by federal courts, listing it as one of his top 10 priorities for the 2017 legislative sessions. “I know we’re going to do photo voter ID again,” he said. The push to make it harder to vote is especially concerning in Michigan given how the state has already subverted local democracy through the emergency-manager law, which has had disastrous consequences in cities like Flint. Half of African Americans in Michigan live in cities that no longer have local control. When voters overturned the emergency-manager law in 2012 via referendum, Republicans in the legislature took only 13 days to pass a new one. 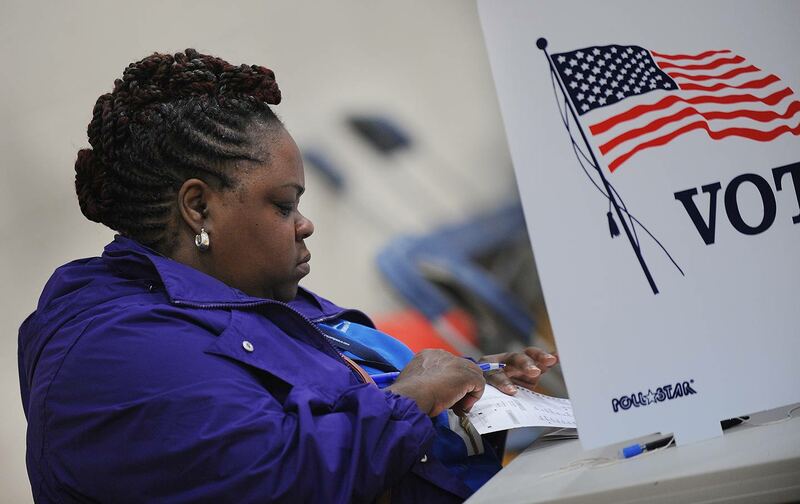 The state’s attempt to ban straight-ticket voting was blocked in 2016 by federal courts, which found it had “a disproportionate burden on African Americans’ right to vote” and would lead to longer lines in cities like Detroit. According to the secretary of state’s instructions, “There may be some applicants who simply are not eligible for a driver license or personal identification card because we cannot adequately identify them.” If that applies to IDs for voting, it means the new law will almost certainly prevent eligible voters from casting a ballot. In 2012, Governor Rick Snyder vetoed bills requiring proof of citizenship and photo ID to get an absentee ballot. With Snyder’s approval ratings plummeting because of Flint, can the governor again do the right thing?